Brian and Sarah bought their duplex three years ago. 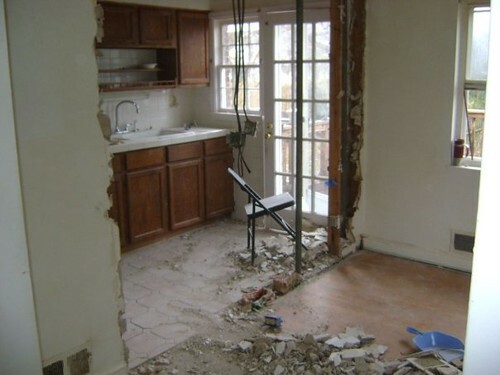 At the time, the house was considered inhabitable and scared away potential buyers. Brian and Sarah were eager to own their first home and weren’t afraid to get their hands dirty. But first, they had to do something about the smell. The previous owner, who had been there 40 plus years, was an avid indoor smoker. The ceilings and walls in the house had considerable smoke damage and required several time-consuming treatments as well as at least two coats of paint on every surface. On top of that, the house immediately needed a new roof — the ceiling was collapsing in the guest room. They also had to take care of some critter issues and address the desperate kitchen and unfinished basement. So what did it look like? 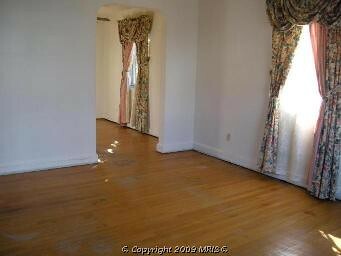 Here is the living room at the time they bought the house. Ok, doesn’t look too bad, but you can’t smell over the Internet. After lots and lots of cleaning, priming, and painting, here is the stunning transformation. Sarah and Brian mixed contemporary pieces from Ikea and Home Goods with antiques and family heirlooms (including Sarah’s grandmother’s paintings) to create a sophisticated and inviting living room. 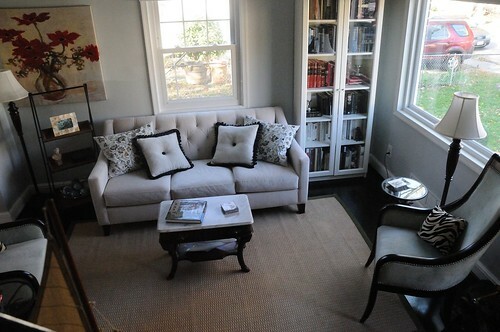 The room is warm and welcoming (and smoke-free) and has plenty of space for a sofa, two chairs, and an elegant piano. 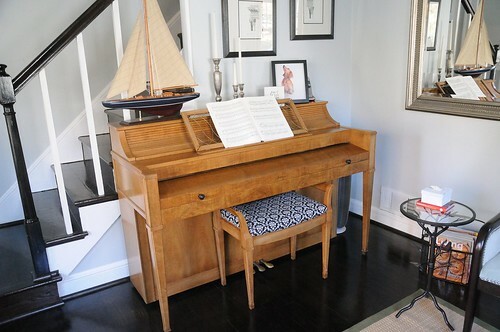 Their attention to detail is incredible — even the piano bench is stylish! The scratched and worn wood floors throughout the whole house were stripped and given a dark espresso finish. 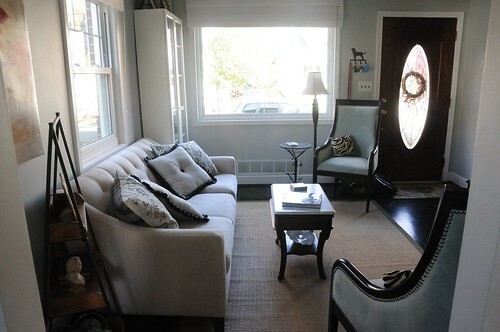 The floors pop when set against the light gray walls and white trim. 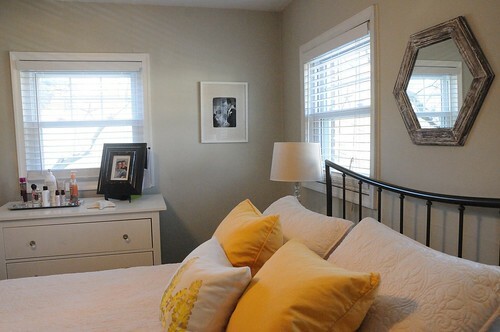 Sarah picked Benjamin Moore’s Wickham Gray for the rooms on the first floor. Brian and Sarah tossed the heavy drapes, letting all the natural light flow right into the room. The front picture window is divine — I can’t imagine why someone would want to cover that! 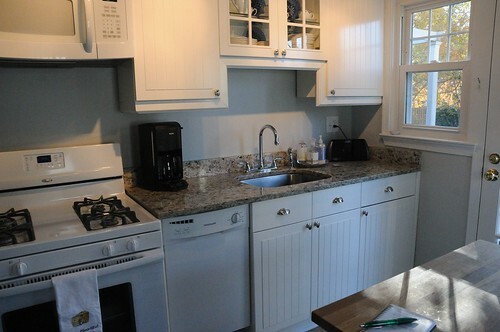 Here is a shot of the kitchen they lived with for two years before they renovated. 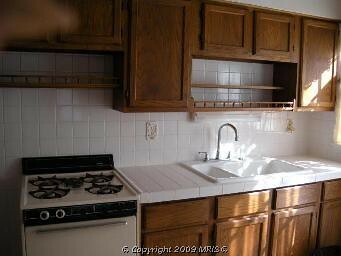 All that white tile reminds me of a bathroom, not a place for cooking meals. During renovations, the wall to the dining room was removed. Sarah and Brian chipped in for the dirty work. 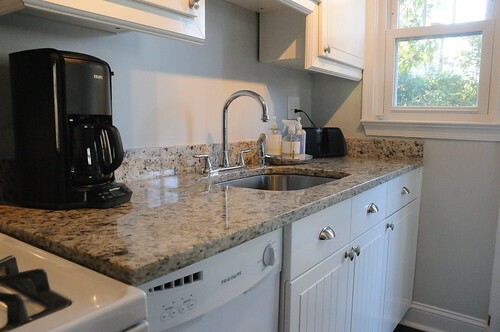 Now they have a light, open and airy kitchen boasting bright white cabinets and sparkly new granite with an undermount sink. They even made room for a dishwasher. Where a wall once stood, they placed a butcher block island from Ikea. 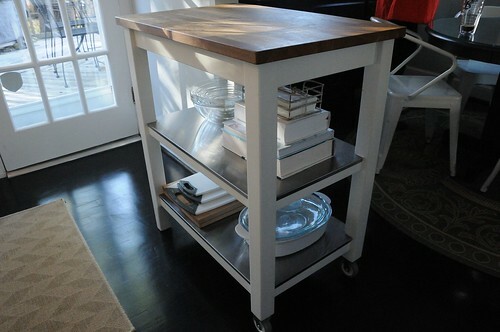 They can easily move it to the side of the room when they have guests over to gain more space. They also carried the refinished wood floors seamlessly into the kitchen — this makes the rooms feel larger and more unified. 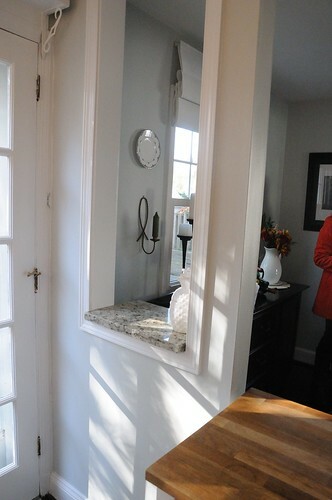 I especially love all of the charming architectural additions such as the pass through from the kitchen to the dining room with the same granite counter. 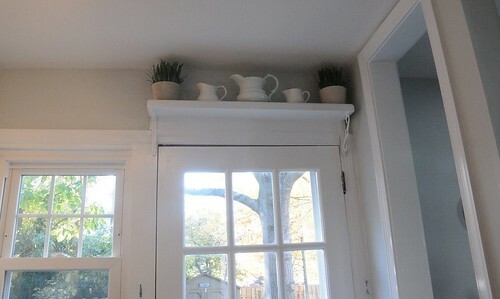 Though the shelf above the back door is a decorative element here, it could also be used to store canisters of dried goods or even small cookbooks and kitchen equipment (but I think their pitchers are adorable and may have to steal this idea myself!). 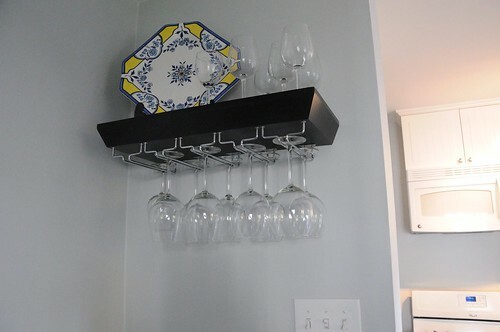 Another clever use of space is this decorative yet functional wall-mounted wine glass rack in the dining room. 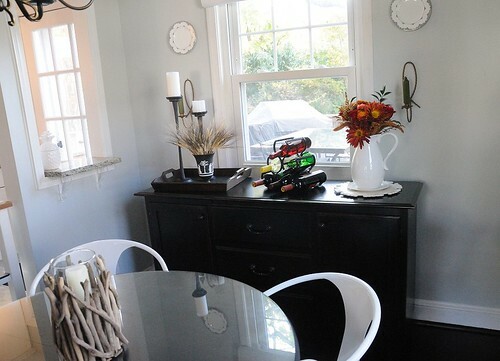 The paint color from the living room continues into the dining room and kitchen. You’ll also note one of their many DIY projects — they painted an old dining table and had a piece of glass custom-sized for the top. In a small dining room, a round table is a smart choice, letting guests easily move around the room. 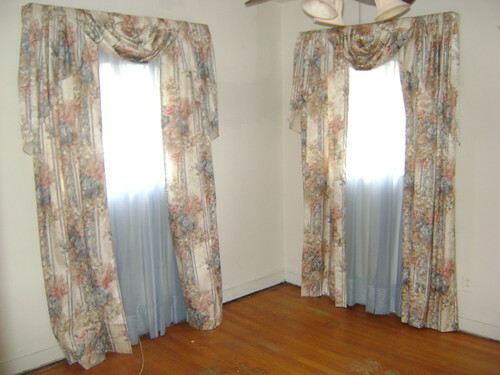 Moving upstairs, in the old bedrooms they found… more drapes! 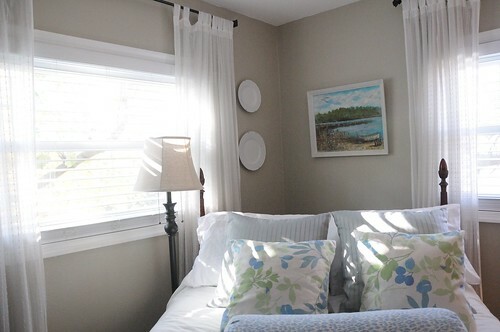 In the guest room, simple white shears on black iron rods replaced those stinky old drapes. The guest room is so so cozy and placing the bed at an angle is a creative way to make the room seem bigger. 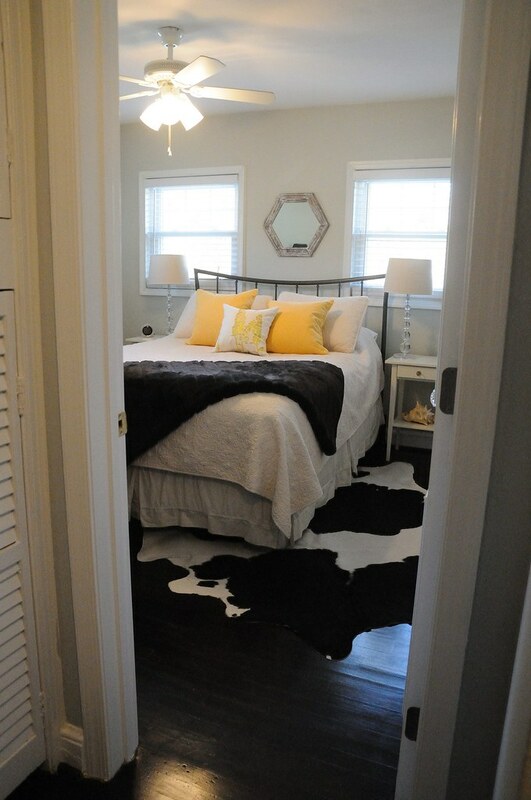 More coziness awaits in the master bedroom…. The walls are the color of sand and make me feel like I’m at a cottage on the eastern shore, not in a Washington, DC suburb. Ah, so peaceful. Sarah found the Ikea dresser on the side of the road. After some cleaning and the addition of new glass knobs, it was just like new. 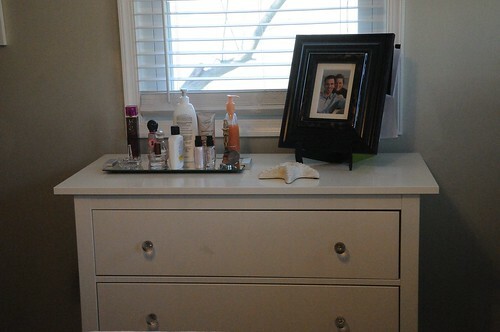 And a perfect match for the nightstand she already had in that same Ikea style. 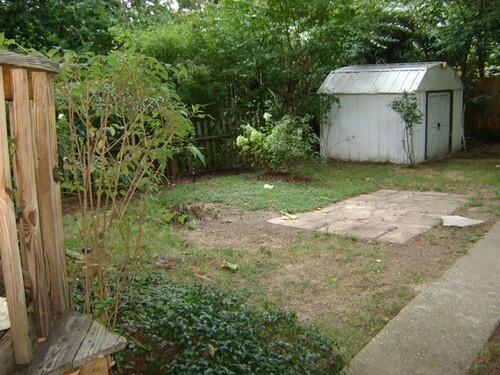 Moving outside, here’s a before shot of their spacious, yet neglected backyard. They removed the oddly placed concrete patio and planted lush green grass. 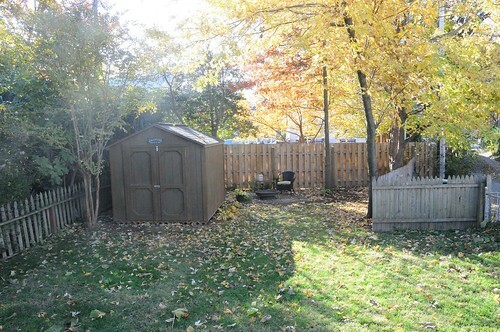 A wood shed replaced the sad aluminum one, and if you look closely, you’ll see two chairs alongside a fire pit. 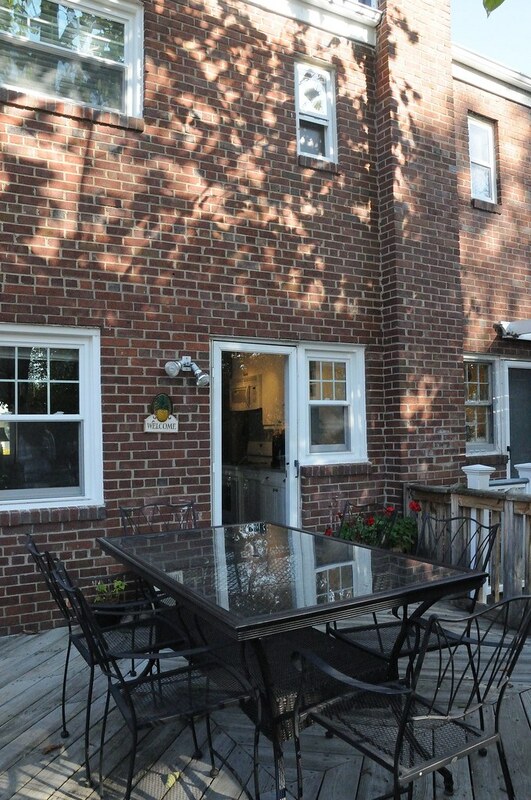 Now this is the healthy and happy backyard a Del Ray duplex deserves. One of my favorite spots is the deck just steps off the kitchen. I would eat every meal here if I could. With a little help from a few contractors for the big jobs, Brian and Sarah made their way through a long to-do list. Goes to show even the most uninhabitable of houses doesn’t stand a chance against a crafty, handy, and design savvy couple.